Philips Original Radio Mini review | What Hi-Fi? Some products appeal as soon as you get them out of the box. 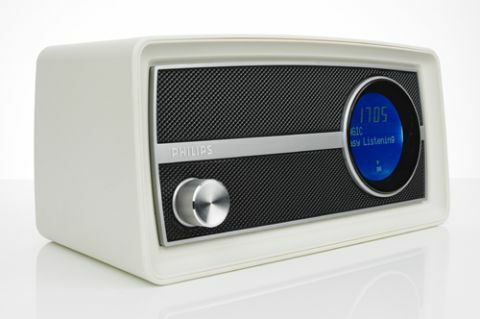 The Philips ORT2300 Original Radio Mini is a retro-styled radio alarm clock that had us smiling at its looks from the off. Its build isn’t quite in that same league – it’s undeniably plasticky – but cost savings have to be made somewhere. This is a well-specified radio/alarm for the money, too. As well as the usual DAB and FM tuners to go along with the auxiliary input and alarm functions, this good-looking desktop/worktop unit also has Bluetooth connectivity as an added bonus. There’s even a really handy app for your smartphone to control everything. The aerial is almost as old-fashioned as the radio’s looks: rather than the adjustable telescopic metal wand that we’ve become used to in radios such as these, the ORT2300 comes with an old-style long flexible length of plastic-coated wire. It might not be the most stylish way to receive a signal, it’s true, but it’s a mighty effective one, and we found the Philips’ grasp of a signal to be cast-iron. Tuning in to DAB or FM stations is a simple matter: for DAB stations, the unit will do an autosearch and store stations with sufficient signal strength. Tuning in on FM is similarly straightforward. There are 20 presets for each tuner so all your favourite stations should be easily accessible. To connect via Bluetooth, just toggle through to the Bluetooth setting using the source button, then search for the Philips using your smart device. We had no difficulties linking a number of products. The display on the face of the radio provides clear information on station data, time and alarm settings. The sound the Original radio mini provides is clear, warm and comfortable and is especially good with voices – just what you’d want from a radio/alarm in fact. Its tonal quality is similar to that of Philips’s new range of headphones – such as the Fidelio X1 – and we love those, too. While it excels with voices, the Philips doesn’t do disservice to the rest of the frequency range. Bass is reasonably tight and fast, and treble notes are clean without being strident. This unit’s pièce de résistance, though, is Bluetooth streaming that sounds good for the money. While music played from your smart device via Bluetooth sounds a little thinner than tunes coming from FM or DAB, it’s perfectly listenable for extended periods. Unlike with some price rivals, we’d not hesitate to use the Bluetooth capabilities on this unit – which brings a whole world of internet radio in to play as well as all your digital music. This is a great value radio alarm clock. It would be that without its successful Bluetooth capabilities. The fact that it performs its wireless services so competently means it’s very impressive indeed, and excellent value for money.